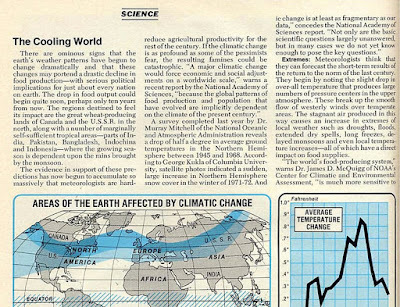 Here is the text of Newsweek’s 1975 story on the trend toward global cooling. It may look foolish today, but in fact world temperatures had been falling since the 1940's ("the 40's blip" in the leaked emails). Around 4 years after this article was published, temperature changes reversed direction and resumed the general rise that had begun in the 1880s, bringing us today close to 1940 levels. The temperature trend again reversed direction, entering another cooling phase over the past decade, in association with decreased solar magnetic activity.